The EU could be ready to drop some of its “red lines” from the Brexit deal it struck with the UK to “help” save it, Chancellor Philip Hammond has said. He did not believe the EU would scrap the backstop plan to keep the border open between Northern Ireland and Ireland. But some EU leaders were “looking at what they can do” to change it. Andrea Leadsom has, meanwhile, said the EU would delay Brexit for a “couple of weeks” to help get a deal through. She told the BBC’s Newsnight that due to our “very strong relationship” with the EU, a short extension would be “feasible”. But Downing Street said: “There is no change to our position. The UK is set to leave the EU on that date, with or without a deal. Theresa May is battling to get her plan through Parliament, despite the fact it suffered an historic defeat in the Commons last week – losing by 432 votes to 202. A major part of the loss was because of the controversial backstop, which is the fallback position for after Brexit to ensure a hard border is not introduced. Without a hard border, there will be no checks on people or goods passing between the two countries – as it is now. Critics claim the backstop plan separates Northern Ireland from the rest of the UK by keeping it more closely aligned to EU rules. But its backers say it will prevent political tensions rising along the border. Downing Street said it was continuing conversations with MPs to address a range of concerns about the backstop ahead of the plan returning to the Commons on Tuesday – including with hard-line Brexiteers in the Tory Party and the DUP, which supports the government in Parliament but voted against her deal. Both sets of MPs have said they will not vote for the PM’s deal while the backstop is part of it. No 10 admitted they were “not there yet” with a new proposal to take to Brussels, but said there was a clear message from the EU that they wanted the UK to leave with a deal and, in order to do so, there will have to be some changes. Some backbench MPs are trying to make the deal more palatable by removing, replacing or time-limiting the backstop, while others are trying to force ministers to delay Britain’s departure from the EU for up to a year if MPs can’t agree on a deal by 26 February, to prevent a no-deal Brexit. Speaking to BBC Radio 4’s Today programme from Davos earlier, Mr Hammond said leaving with a withdrawal agreement was the “only credible and sustainable way” forward and warned of “very significant disruption” for the UK economy if the country left the EU without a deal. But he claimed some European politicians were “thinking very hard about where the European Union has drawn its red lines [and] whether they really need to be in the place where they have been drawn”. He added: “What I am hearing from European politicians and commentators is that they do take this issue very seriously, they understand the challenge that we have got at home and generally – not all of them, but many of them – want to help. French finance minister Bruno Le Maire said it was up to the British government to find a way out of the situation, not EU member states. He told Today that the backstop issue was “done” and the EU had “nothing to give” on the Brexit deal apart from “clarifications”. 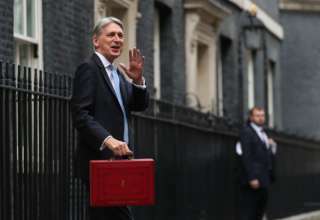 Mr Hammond said the French had “always been the hardest in this debate” and talking to other European politicians would offer “a more balanced view”.